Belts for laser machines. 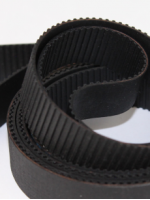 If you cannot find a specific belt length here, feel free to give us a call. We will be happy to find the nearest belt-length, and size it to your needs. 3000mm long, 3mm pitch belt, 15mm width. Open Loop. Manufactured from neoprene rubber with fiber glass core. ..
4260mm long, 5mm pitch belt, 15mm width, 4mm belt thickness. Closed Loop. Manufactured from neoprene rubber with fiber glass core. ..
600mm long, 2mm pitch belt, 15mm width, 1.25mm belt thickness Closed Loop. Manufactured from neoprene rubber with fiber glass core. ..
640mm long, 2mm pitch belt, 15mm width, 1.70mm belt thickness Closed Loop. Manufactured from neoprene rubber with fiber glass core. ..
810mm long, 2mm pitch belt, 15mm width, Closed Loop. Manufactured from neoprene rubber with fiber glass core. ..
910mm long, 2mm pitch belt, 15mm width, Closed Loop. Manufactured from neoprene rubber with fiber glass core. ..